For those from sugar producing nations there has been a particularly interesting little frenzy in that market during the holidays. The FT Alphaville site has a concise explanation. There is something else, though, not explained in the piece. In the name of food security the Government of India (GoI) operates a price control system on certain grains and softs. Last year they raised the minimum prices on both rice and wheat. Unsurprisingly, farmers planted more of both. As of July this year stocks for the pair (33m tonnes of wheat, 20m tonnes of rice) were double what the GoI considers adequate buffer levels. The flip side is that sugar under cultivation fell both as a result of these controls and on the back of consecutive bumper harvests into the 2006 season which did little for prices. Fast forward to now and, well, you cannot reap what you don't sow. Consensus appears to be that next year will also see a “deficit” sugar harvest. As a result futures are in backwardation (see chart below) – a sign of great market strength - as industry and speculative buying piles in hoping to ride the proverbial Jim Rogers commodity quintuplet. Small prediction. The sugar cycle runs 15 months in India, the second largest global producer in 2008 (28.8m tonnes, 2.6m less than Brazil). Without doubt the big growing states of Uttar Pradesh, Maharashtra and Tamil Nadu are already looking beyond the imminent end of this year's harvest at ways of bringing more land into cane production. And, if domestic food security policy runs true to form (India is the largest consumer of sugar), there may even be some cycle-exaggerating GoI production encouragement to mix in (this NYT piece is an excellent primer). In short, bulls be careful. 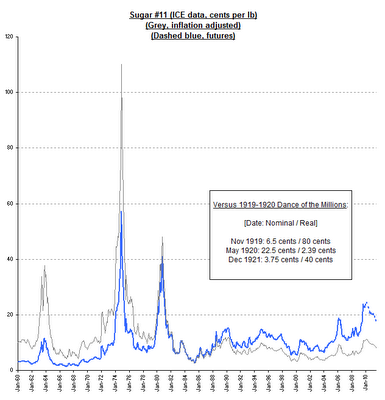 Footnote: the Granny of the 1974 and 1980 OPEC Inspired Sugar Booms and Busts (for those who did not have it fed to them at school) was the 1919-1920 Dance of the Millions. The real price per pound rose 350% over 6 months to hit $2.39. Over the next 7 months it then fell 80%. Nice paper on it here. Different circumstances, some parallels (tangentially, substitute “sugar market” for “credit market” and have more fun still) and probably a similar result in due course. For sure India will not be alone in looking to secure today's higher prices.